A useful feature found in most FTP client software such as FileZilla is the ability to enable concurrent transfers whereby you can connect to the FTP server using multiple connections to simultaneously upload 10 files instead of just 1 file. However, there are also some web servers that enforce connection limits and when you go over the limit, the firewall will automatically ban your IP for a few minutes. This is a huge annoyance faced by many webmasters because there are times, such as upgrading a forum software, that require uploading a few thousand files and it takes a long time to complete the transfer due to the connection limit. This is not a problem if you own a dedicated server where you can increase the connection limit but if you’re on a shared server, chances are the support team will not entertain such a request. A solution to this problem is to upload a single ZIP file using your FTP client software and then use a PHP script to extract the file to the designated folder. cPanel is the most popular control panel that is used by many web hosts. If you have access to your shared server’s cPanel, then very likely there is a web based file manager that you can use to extract zipped files that are located on the server. All you need to do is right click on the archive file and select extract. You will then be prompted for the path to the file that you wish to extract. 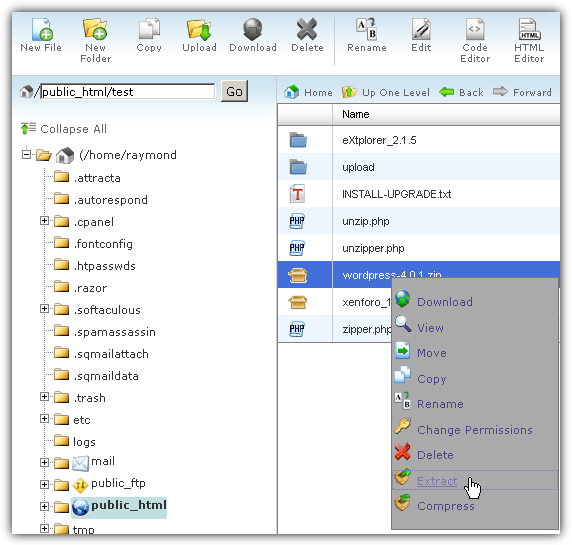 cPanel file manager supports extracting ZIP, GZ and BZ2 archives. If your web server doesn’t have cPanel, do not fret because here is an alternative free web based file manager called eXtplorer that allows you to extract archives. Since it is a fully featured web based file manager, the software itself contains 415 files which require uploading to your server first. eXtplorer is very easy to install as all you need to do is upload the whole directory to your webserver, access the URL of the uploaded folder from your web browser and you can login with the default username and password “admin” (without the quotes). After logging in, you will be prompted to change the admin password for security purposes. Once you’ve done that, browse to the archive file which you want to extract, right click on it and select “Extract Archive”. Unlike cPanel that prompts you for the path to extract the files, eXtplorer will simply extract the files to the folder where it currently resides. It would be safer to extract the ZIP archive from an empty folder to prevent accidentally overwriting an existing file. 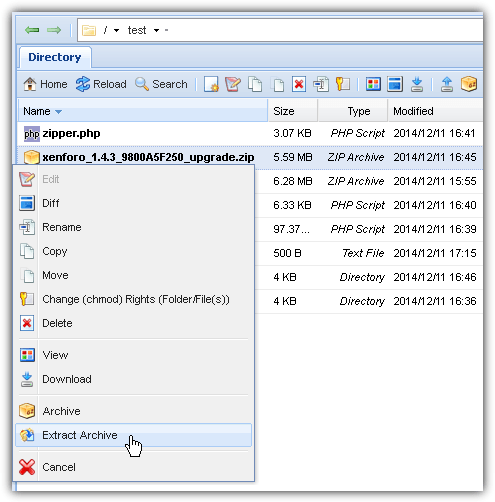 The Unzipper is a PHP script that can extract ZIP and GZIP archives on webservers. All you need to do is upload a PHP file and access the file from your web browser. The Unzipper will only list any ZIP/GZIP files that are located in the same directory as the PHP script in the drop down menu. So if you don’t see the archive file that you want to extract, double check the location of the unzipper PHP script and the ZIP/GZIP file. This PHP script works slightly different than The Unzipper by allowing you to upload ZIP files from your web browser and then the script will automatically extract once the upload has completed. This saves you the trouble of even launching your favorite FTP client program to upload the ZIP archive file. An important note is that this script extracts the content of the archive into a new directory with the same name of the archive file. In other words for 7-Zip, this PHP script uses “Extract To” instead of “Extract Here”. net2ftp is a popular web based FTP where you can access your FTP server directly from your web browser and perform FTP commands without using a FTP client software. After connecting to your FTP server from net2ftp, select an archive file and click the Unzip button located at the top right to extract the ZIP file. Actually none of the FTP clients can extract or unzip archive files on the FTP server because there is no such command in FTP. However, net2ftp makes it possible by downloading the archive file from your web server, extracts the files in their server and then upload all the files back to your server. Hence, you might notice that it takes quite a long time for net2ftp to complete uploading if there are thousands of files in the archive. Additional Tip: If you’d like to use eXtplorer File Manager but are having trouble uploading 400+ files, you can make use of the PHP script from the 4th method to upload the eXtplorer archive file which it will auto extract once the transfer is completed. net2ftp is closed in EU and run PHP on a server that is not mine is probably not allowed. Thank you man. You helped a lot. -I’m using 000webhost and I not exactly sure how to select the url once I’ve uploaded both the zip file and unzipper.php into the online file manager. I’ve tested this out with xampp(Apache) and it works great but how do you do it on a shared web-host service like 000webhost? Oh. Got it! Wow! The Unzipper is powerful. I unzipped a large file with thousands of files in seconds. Many thanks Ray! One of the most useful tips Ray, thank you very much. this is awesome i’ve got the same issue like yours! !